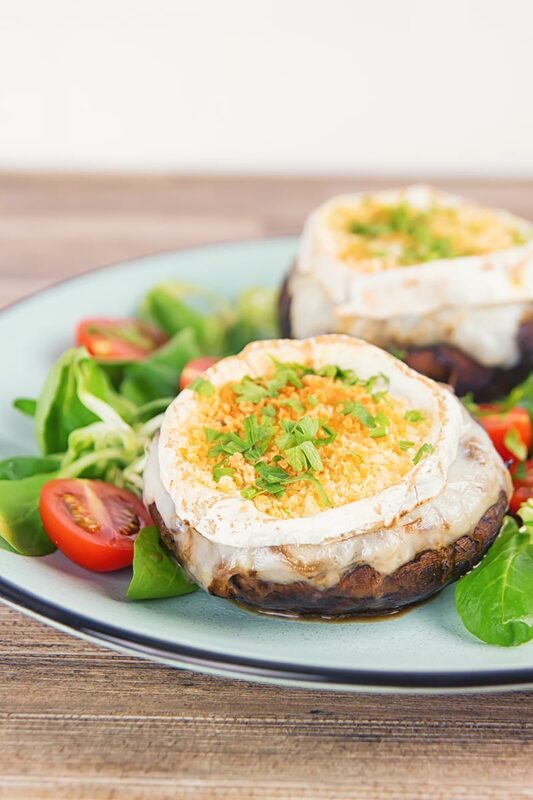 These stuffed portobello mushrooms evoke the flavours of a classic goats cheese and onion tart stuffed inside wonderfully baked mushrooms. Caramelised Onion and Goats Cheese Stuffed Portobello Mushrooms. 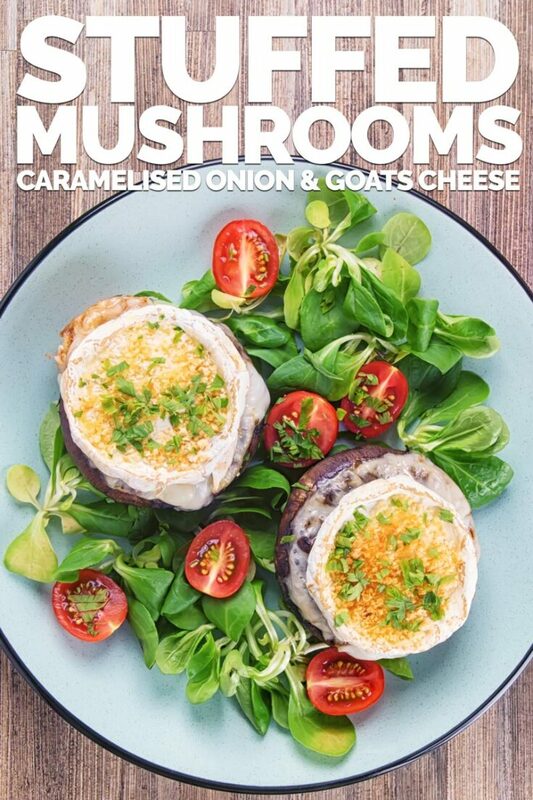 These Caramelised Onion and Goats Cheese Stuffed Portobello Mushrooms are a real treat. The flavours are very much influenced by the classic goats cheese and onion tart. I have a complicated relationship with pastry, so this makes it so much easier! So think beautifully sweet caramalised onions paired with acidic salty goats cheese. Add a sprinkle of thyme and some balsamic vinegar before stuffing into a meaty portobello mushroom. 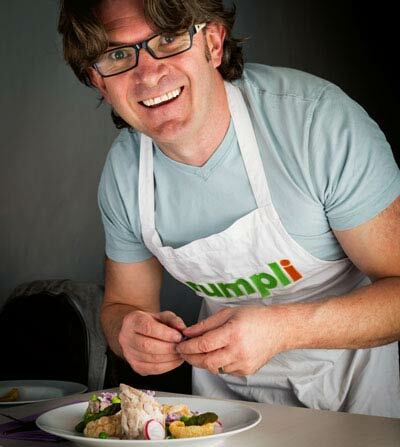 This is not the first stuffed mushroom recipe here on krumpli and it will likely not be the last. Stuffed mushrooms are so versatile, my last recipe was stuffed with cheese and nutty brown rice, then cooked on the BBQ. This recipe happens to be cooked in the oven. But you could roast these on the grill over indirect heat and they will work superbly. Sadly portobello mushrooms are not readily found here for some odd reason, but I do pick them every time I see them. Fingers crossed there is a shorter gap before my next one! There is one secret to perfect caramelised onions… That secret is time! There is no way to rush it and anyone who tells you otherwise is being economical with the truth. They are not difficult, all you need is a little oil or butter. Naturally, I use butter, and off you go. You keep the pan at a medium heat and stir every so often ensuring that the onions do not begin to colour in the first 10 minutes or so. If they do your heat is too high, turn it down. They do work a little better if you do not use a non-stick pan, but if that is all you have they will still work. It will take anywhere between 40 minutes and an hour… It really does depend on the onions and their moisture content. But be patient and don’t be tempted to turn up the pan. If you are so inclined caramelised onions freeze really well! Yes really! 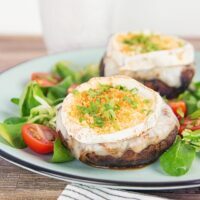 As a result, they can be batch cooked, meaning you have them on hand for burgers, these stuffed portobello mushrooms or even my cheese and onion quiche recipe. Mushrooms make a fairly regular appearance here on my site. I love em, apparently, there are a significant number of people that don’t, who knew? I think they have the most wonderful flavour and texture, but they also adapt to different flavours really well. So here in these stuffed portobello mushrooms, they soak in that balsamic flavour in much the same way as they do in this mushroom pasta recipe. Worcestershire Sauce in this Mushroom Poutine Recipe. Soy and Hoisin in this Stir Fried Beef Recipe. Beer in this Beef and Mushroom Pie. Red Wine in this Wild Boar Stew. Mushrooms are in effect great flavour sponges making them a great addition to so many recipes. Of course, they are also perfectly capable of standing on their own and being the main flavour of a dish as in this wild mushroom soup. A real treat for the fungiphobe! 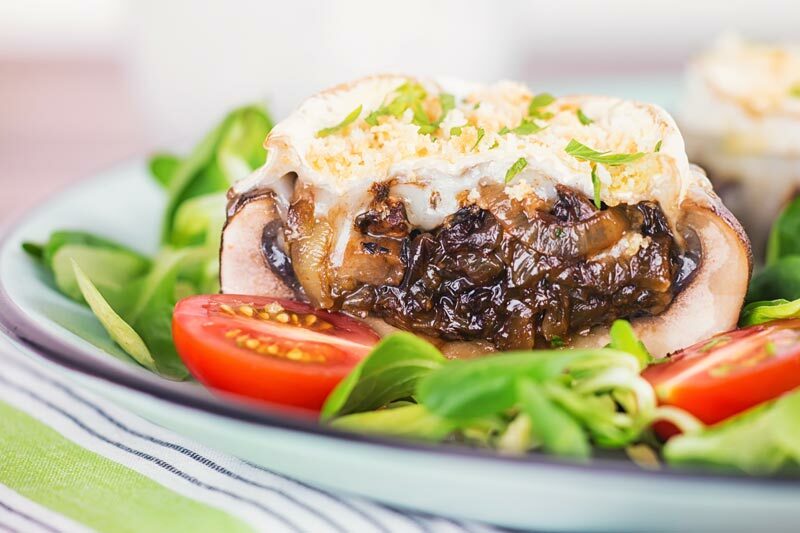 Stuffed portobello mushrooms that feature the flavours of a classic goats cheese and onion tart. Then baked for a luxurious delicious lunch or light dinner. Slice your onions into half moons about 3-4mm thick. Heat a pan over a medium heat and add the butter. Add the onions and thyme and then cook for 45 minutes stirring every so often. If the onions colour too quickly turn down the heat. After 45 minutes add the balsamic vinegar then reduce until jammy. Remove the stalks from the mushrooms and finely dice and add to the mix. Taste and season with salt as required. Drizzle the mushrooms with a little olive oil all over and then season the inside with salt and pepper. Stuff the mushrooms with the onion and balsamic mix. Cut the goat cheeses in half and then place on top of the mushrooms. Sprinkle with the breadcrumbs and drizzle with a little more olive oil. Bake for 15 minutes at 180°C or 350°F. Made these tonight, with trepidation as I am most definitely not a natural cook. Comments were: “That was really nice” and “I’d be happy if I was served that in a restaurant”. Praise indeed, and received in shock! (I usually get “please don’t cook that again”! )The only minor criticism was maybe a tad too much onion, but maybe my mushrooms could have been a bit larger to accommodate. Thank you! Wow! I wanted to reach through the screen and grab one. I have had stuffed portobellos before, but never anything as beautifully put together as this. The carnalized onion really makes it for me! 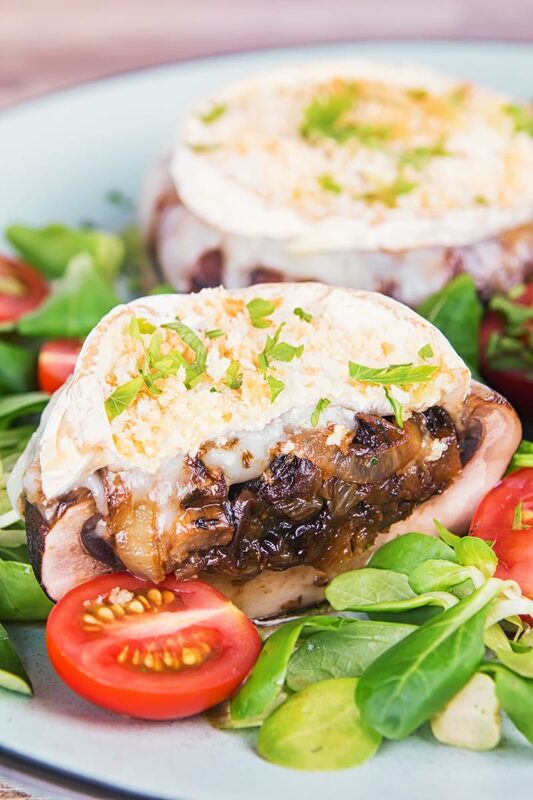 Stuffed portobellos are a favorite. I even use the mushrooms as hamburger buns. Can’t wait to try this recipe! I’ve seen that technique used, I’m not 100% convinced by it by I am sure I will try it some time. Oh wow, these look so good! You just can’t beat stuffed mushrooms and that filling sounds absolutely delicious! Properly slowly cooked caramalised onions really are one of the world of foods special little wonders. Yummy! This made me drool. Cannot wait to try this. This recipe looks incredible! Thank you.